i am sam wasn't a movie I was expecting to like. I find that more often than not, films about people with developmental disabilities tend to be rather syrupy and mawkish (I'm looking at you, The Other Sister). Even Rain Man, a film I genuinely enjoy, suffers from occasional bursts of cloying cuteness. So no one is more surprised than I that sam, from director Jessie Nelson, is refreshingly even-handed, touching and, at times just heart-wrenching. Sean Penn (in a remarkably subtle and engrossing performance) is Sam, who, with an I.Q. of about 70, is content making his way in the world by working a menial job at Starbucks, cleaning tables. After a drifter settles in his apartment, becomes pregnant with his child, gives birth, then runs away, Sam is forced to push his limits, raising the girl—named Lucy Diamond (Dakota Fanning) after the Beatles' song—largely by himself. He does have the help of his agoraphobic neighbor Annie (Dianne Wiest) and his group of disabled friends (including character actor Doug Hutchinson and real-life disabled actors Brad Allan Silverman and Joseph Rosenberg). The film's first 45 minutes focuses solely on Lucy and Sam's relationship, and it seems like it's going to be another "disabled people are the happiest people" story, with cutesy scenes of the two swinging together at the park, eating at the IHOP, and buying clothes. But once Lucy starts school, it becomes clear that she has begun to surpass her father in mental ability (which tests show is about that of a seven-year-old). Eventually, the Dept. of Child and Family Services (DCFS) takes the child away, and the next phase of the film begins as Sam fights for his daughter with the help of fast-talking, closed-off lawyer Rita (Michelle Pfeiffer). There are many opportunities for sam to take a wrong turn in the second half and become a typical story of the system interfering with a happy family. But the script (by Nelson and co-writer Kristin Davis) is equitable and assured, never taking sides. The people trying to take Lucy away from Sam (including The West Wing's Richard Schiff as a DCFS lawyer and Laura Dern as an emotional foster parent) are clearly doing so in her best interests; it is never clearly suggested that a life away from Sam would necessarily be worse for the girl. Nelson and cinematographer Elliot David shoot with a handheld, documentary style that lends the story an intimacy and a glimpse into Sam's subjective point of view (as in the courtroom scenes, which are choppily edited to show Sam's confusion and inability to concentrate). Penn was nominated for an Academy® Award for his performance, and he manages to make Sam a real character, never merely a simpleton or a loveable oaf. Sam is easily confused and often lashes out, and the depths of emotion and subtle mood swings that Penn manages are often amazing. Pfeiffer isn't as good�her caffeinated histrionics feel familar�but she's affecting all the same. Dakota Fanning, on the other hand, is remarkably mature but still childlike, and her chemistry with Penn is remarkable. Sam loves The Beatles, and the soundtrack is made up of Beatles' covers from artists like Aimee Mann and The Wallflowers�old songs sung well, perfectly blending emotion and imagery. i am sam is likewise not original, but it is an old story told very well. Image Transfer Review: This is a very fine transfer that captures Elliot Davis's stylized cinematography quite well. Many scenes are shot with extensive filters to create Sam's subjective point of view, and from the icy blue courtroom scenes to the rich, warm tones of Sam and Lucy's home, all retain their cinematic effects on DVD. Black level is strong, and the few night scenes sport fairly strong shadow detail. I noticed no obvious artifacting or edge enhancement, and only a touch of aliasing. Overall, a typically strong transfer from New Line. Audio Transfer Review: Though it isn't a film that demands a dynamic transfer, New Line has provided i am sam with both DD 5.1 and DTS mixes. The results are very good for both tracks, which feature a subtle, enveloping soundfield. Dialogue is clear, natural, and anchored in the center channel. The soundtrack of wonderful Beatles covers is spread across the front soundstage with support from the rears. The surrounds are also effective in revealing, once again, Sam's point of view, with his confusion translating into the audio swirling around all the channels. Differences between the two tracks are negligible; both sound wonderful. Extras Review: i am sam is a member of New Line's much-loved Platinum Series, and it has extras that rival any other such titled disc. The emphasis with the Platinum Series seems to be quality over quantity, and the inclusion of worthwhile, insightful extras is much appreciated. First is the commentary track from director/co-writer Jessie Nelson. Nelson clearly is very passionate about the project, and she offers up a wealth of insight into her directorial choices, from the encouragement of improvisation to the use of filters, at times, to present a skewed reality. She's a bit too pleased with her film for my tastes, though, frequently commenting that a particular scene is "wonderful" or "telling," and her praise of Pfeiffer and Penn goes off the charts (I'd like to go back through and count the number of times she says she loved an actor's "choices" in a particular scene). Overall, the track is worth a listen, provided you can sit through all of the adoration. Much better is the 42-minute documentary Becoming Sam, which is broken down into six different segments. Inspiration and Research covers the genesis of the project and features footage of the writers visiting disabled individuals at a center in Los Angeles. Casting the Film reveals just how so many talented individuals came to be involved in the picture, and includes comments from the director and producers as to their thought processes in finding just the right actors. Creating the Characters focuses on Pfeiffer and Penn's efforts to bring to life characters that felt spontaneous and genuine. Particular focus is given to Penn's ability to truly sink into character and "become" Sam. Look and Feel of the Film features an interview with the director of photography Elliot David, who explains the artistic reasons for shooting the film in a hand-held, documentary style (I found this section interesting, but a little over the top, especially when, describing a day when David was crying after shooting an emotional scene, Nelson explains that his emotion was not because he had witnessed a powerful piece of drama, but because he had participated in it). Producing the Soundtrack is an excellent piece on the complications of putting together a soundtrack featuring the music of the most popular rock group in history. Interviews are provided with some of the featured artists, including Rufus Wainwright, Michael Penn (Sean's brother), and Aimee Mann (who happens to be just about my favorite singer/songwriter). Finally, Final Moments offers a few closing comments on the experience of making the film as true to life as possible. Overall, the documentary avoids fluff and PR material to focus on real making-of content, artistic insight, and production stories. Perhaps a little too self-congratulatory at times, it is still a very entertaining and informative piece. Seven deleted scenes, presented in nonanamorphic widescreen, are offered with or without commentary from Nelson. Most are simply extraneous bits that were cut either for running time or to avoid compromising the emotional arcs of the characters. My favorite selection, Unexpected Moments, is made up of several different clips of improvisation, be it inspired physical comedy from Penn as he interacts with a bunch of dogs, a bit of humor from little Dakota Fanning, or one of the disabled actors telling Pfeiffer's character that he knows Sam "from the movie." Cute stuff. The Press Kit offers extensive production notes (much of this material is covered in either the documentary or the commentary) and bios for many of the cast and crew. Finally, closing out the disc is the film's theatrical trailer. 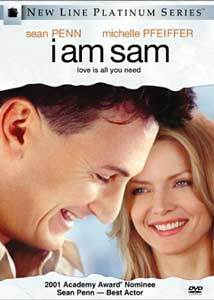 i am sam is a familiar story (I'd call it Rain Man meets Kramer vs. Kramer, but that may be a little bit too on-the-nose), told in such a way that it never feels trite, telegraphed, or clichéd. From the previews, it wasn't really a film I was looking forward to, and I'm happy to reward it with an unexpected recommendation.